Abstract: Kerry Hennigan describes why she had the feeling Michael Jackson was different from his siblings when she visited the Michael Jackson One show in Las Vegas. Hennigan, Kerry. 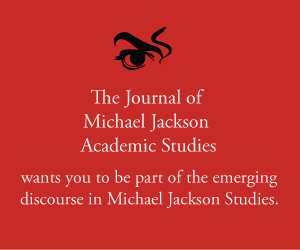 “MJ Studies Today XVII (14-05-2017).” The Journal of Michael Jackson Academic Studies 4, no. 1 (2017). http://michaeljacksonstudies.org/mj-studies-today-xvii/. Photo: Michael Jackson ONE opening night red carpet at Mandalay Bay Resort, Las Vegas © Kerry Hennigan, 29 June 2013. It was the 29th of June 2013 and the official opening night of Michael Jackson One by Cirque du Soleil in Las Vegas. The Jacksons were out in force – well, some of them. I stood on one side of the “great divide” that separated the VIP guests from the press and the rest of us (i.e. the fans). Three of Michael’s brothers stood on the red carpet in suits and sunglasses, smiling and looking happy to be there, enjoying the moment in a battery of flashes from the cameras of media photographers. Behind them, stretching the length of the carpet, was a cloth backdrop featuring an image of Michael standing in profile. It was a familiar pose from the black panther sequence of his ‘Black or White’ short film. The image was repeated over and over along the wall for the length of the red carpet walkway. I really wanted to take that backdrop home with me! As I watched the Jackson siblings standing beneath the multiple images of their superstar brother, it occurred to me that Michael Jackson was like a cuckoo’s chick – hatched in the nest of another bird, raised with its own off-spring, but demonstrably different from them. Those differences had become more obvious as Michael grew up, until finally, it seemed that the mature, adult Michael and his brothers could hardly be members of the same family! Michael’s “otherness” was so obvious! Of course, we know Michael engineered some of the visual differences himself – the nose reduction and dimple in his chin, the diet intended to eliminate anything that would cause an eruption on his skin, (1) his daily dancing routine which was his version of a workout, his use of make-up to mask his Vitiligo condition, the way he wore his hair and the signature outfits he commissioned for his public appearances and performances. However, I don’t believe Michael’s shaping of his physical persona explains all his differences from other members of the Jackson family – differences that were obvious to the likes of Motown’s Berry Gordy when Michael was still a child, learning his craft. Creatively, as a mature, solo performer in charge of his own destiny, Michael never rested on his laurels. Even his “This Is It” concerts were to top everything he had done before – new 3D content, bigger pyrotechnics, new twists on familiar routines and new songs slipped into the shows for subsequent digital release. So, his physical “otherness” is just a clue, a symptom perhaps, of Michael’s drive to realise his own personal vision for himself and his career. He wanted to be the best – the greatest showman on earth. His physical appearance was part of the show, and it made him instantly recognisable everywhere in the world. While the resulting loss of privacy became a nightmare for him at times, his unique persona helped him achieve unparalleled fame and a steadfast global fan base that stood by him through thick and thin – and still do. So, what I perceived on that cloth backdrop above the red carpet in Las Vegas was not so much Michael’s wish to be different from his immediate family members (though I wouldn’t discount that completely), but rather, his drive to be the best he possibly could be. In achieving that he left no room for comparisons. (3) Ryusui Seiryokin “King in the Mirror: The Reflection of Michael Jackson, Vol 1.” The BBB: Breakthrough Bandwagon Books, English edition Lulu Press Inc, 2012.